A few weeks back, I purchased a RoadID during their anniversary sale. I got a great deal, snagged a limited edition color for the band that matched my barn colors (gray), and was all in all excited. It shipped and arrived quickly, with great customer service. Kudos to them! I’m only just now getting around to blogging about it. First, the shipping email? Adorable. A+. Complimenting Vermont always gets you points in my book. Packaging was straightforward and simple. My mother was amused/horrified that I wrote find horse, but I think that’s actually really important. I don’t want to wake up in a hospital three days later and learn that no one has been searching for Tristan, if something awful has happened. And honestly, even if I’m incapacitated in a completely non-horse related accident, I want someone checking on my horse! Note to everyone: if something happens to me, check on my horse. No matter what. 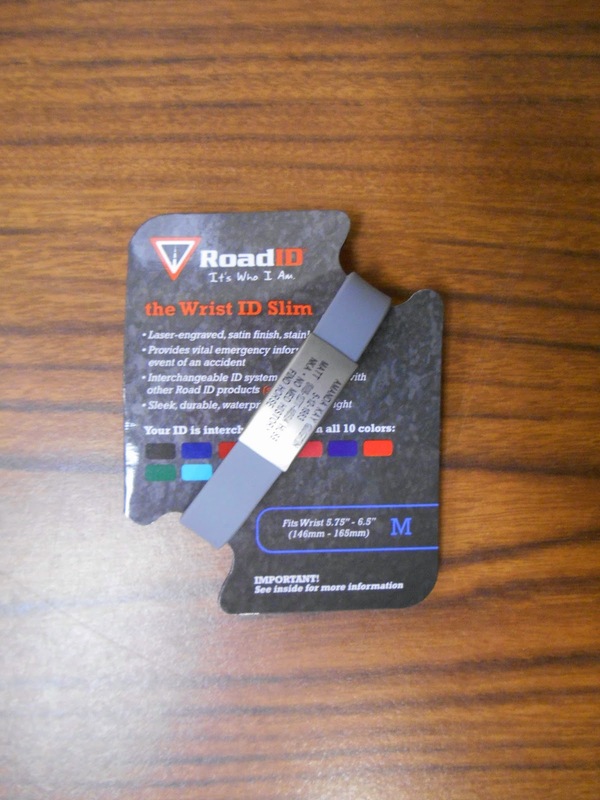 I also bought the RoadID Slim, in medium size, which I was happy with. The Slim is about the width of those Livestrong style plastic bracelets, and medium was good for my wrist, which is on the more solid side – I’m 5’9″ and 160lbs, so not fine boned! If I were any bigger, I’d want to go up a size, but this is a perfect, just short of snug size. 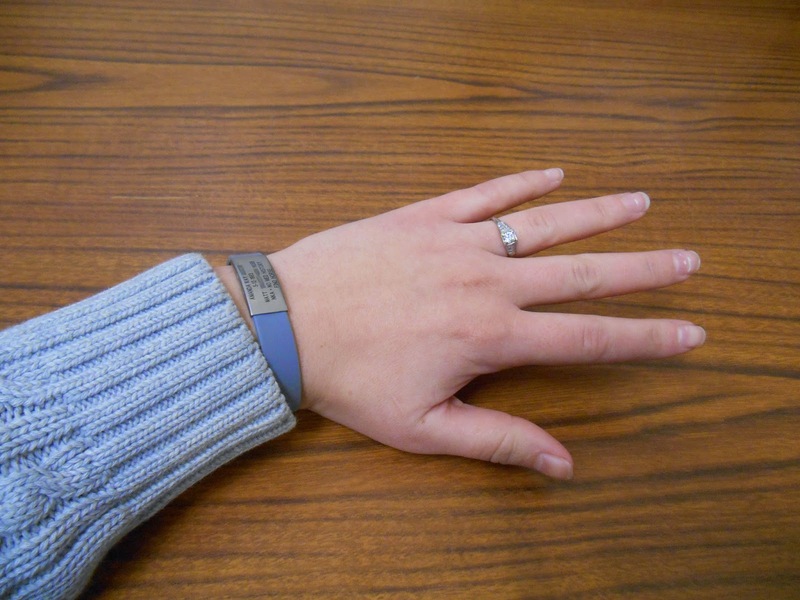 The plastic of the bracelet itself doesn’t snag on arm hair, and is unobtrusive. Right now, for example, I’m wearing it on my left arm and typing and I can only tell it’s there when I think about it. With a little while longer in wear, I’ll forget it is there entirely. When it arrived, I tucked my RoadID down into my purse to bring to the barn…and promptly forgot about it. For a few weeks. So it jostled around in my bag with my keys, Kindle, purse, books, papers, aspirin bottle, you name it. For weeks. And you know what? It still looks great. Other than some dust from various things, which brushed right off, there is not a scratch on the metal plate, which is quite frankly kind of amazing. Most other things that live in my purse for that long get beat up. See? Pretty good size, nice and discreet. I am so happy with it I actually bought the fiance one for Christmas for him to wear while skiing. Now, when it arrived, it came with a bunch of coupons for $1 off a RoadID that it said to give to family and friends. I don’t need ’em. If you would like a RoadID coupon, comment here and let me know, then follow up with an email to beljoeor[at]gmail[dot]com so that I have your contact information. I have three coupons, so first three people who want them get them! Previous Post Explain to Me: Belts?